In early 2010, piccoloist Lois Bliss Herbine offered me a commission to write a new piccolo piece to premiere at that summer's International Piccolo Symposium. My recent FLASH! 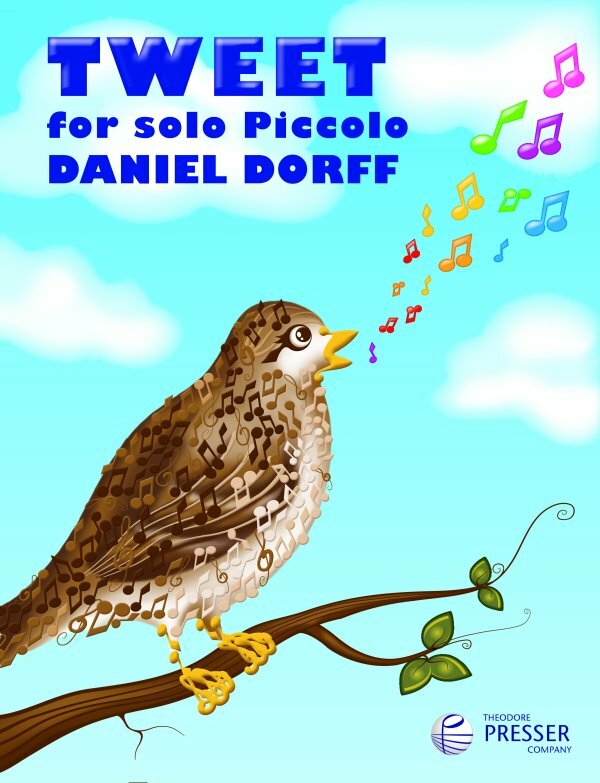 for Piccolo and Piano had been performed at the 2008 symposium and won the composers' competition, and Lois was eager to follow with another Dorff piccolo premiere at the IPS. I agreed and requested to write for unaccompanied piccolo, to add to that type of repertoire and to sound different from my other piccolo music. Looking for a musical idea that was uniquely piccoloistic (rather than flute music in a higher octave), the robins waking me up early every morning in May provided great inspiration, and one morning the opening theme and its contrasting theme poured out quickly. The form and development became a lot of fun to compose, with lots of elements of rondo, variations, and particularly using lots of timbre contrasts as a way to make a full sonorous experience out of an unaccompanied piccolo work. I knew from the start that the publication's cover art had to be a robin chirping out animated eighth notes. While this indirectly alludes to the hummingbird cover art on Lois Herbine's Crystal CD "Take Wing" which includes my Sonatine de Giverny, it just is a perfect homage to the robins that inspired the music, the animated chirping of the music, and an image that was born with the music. The wonderfully charming cover shown below was created by my daughter Julia Mieko Dorff, and was a very gratifying collaboration! - The opening "strict tempo" doesn't mean it has to be at quarter = 124, it just means to play tempo giusto, rather than with rubato. It's fine to go a bit slower (or faster) than 124. - Bar 54 is just a poco cresc., perhaps to mf; better to save ff till the subito ff at 63. - Make the most of all the subito dynamics and timbre changes, that will make the form very 3-dimensional ! Here's a complete live performance by Gudrun Hinze at Gohlis Castle in Leipzig.